Oh I'm not thinking that heavy of a load.....If I hit 4 drams I'll likely stop, but that is no wounding load in my book. Plenty of powder for anything I'll go after. You are quite correct, Lieutenant Forsyth. According to Baker, 4 to 5 drams - through and through an (Indian) elephant's head with hardened ball - 14 bore. General? My book says he was Lieutenant James Forsyth,M.A. - as of 1863. What happened after that, I do not know. Your results will be interesting indeed. 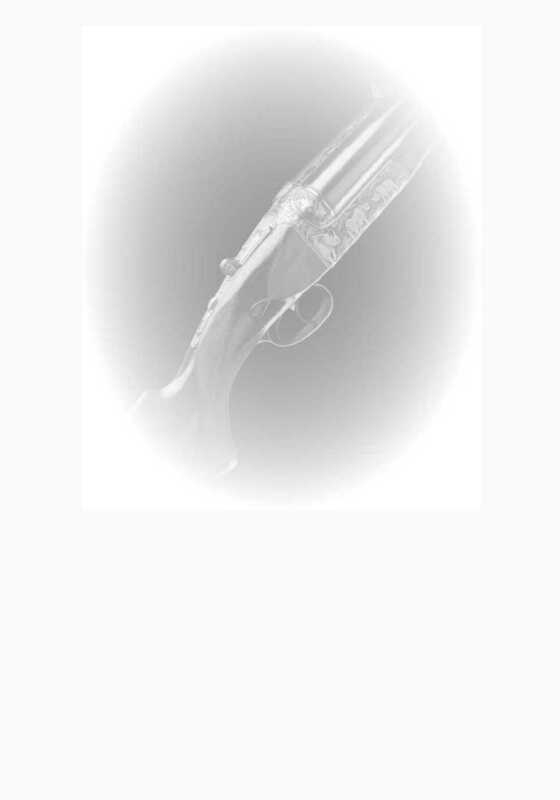 In the days Forsyth's book was written, the fast twist guns with standard rifling did poorly, stripping, etc. Grooving as your rifle was done to prevent stripping. Forsyth's concerns even with the belted ball in fast twist barrels, was they they were not accurate with the large charges normally used for tiger, buffalo and elephant. He stated that their owners merely used the heavy charges anyways and put up with less accuracy, they still shot as well as smoothbores, which worked in close just fine. I've shot several smooth bored 20 to 11 bore guns that will hold right about the 3" to 4" for 5 shots at 50 yards with tightly patched balls. To prove Forsyth wrong about his twist criticisms & their unsuitability for large dangerous game, you would have to use the same loads as he did - 5 to 8 drams or at least 4 1/2 to 6 drams - as in 123gr. to 164gr., as well as using a powder like Swiss 1 1/2F or 2F. I am fearful your old stock might not like that very much, but, the results would be MOST interesting. Mate, I am interested in how you go with your two groove rifle. I frequent the British Military Forums and two groove Brunswicks are shot there with belted balls and not much success. The Brunswick was supposed to supersede the Baker in the British Army but it was not ver successful. 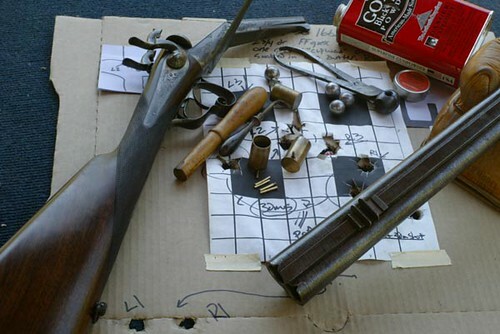 I am currently working up loads for an English percussion sporting rifle with Forsyth style rifling, 1 turn in 100 inches, using 4 1/2 drams of Fg with a patched ball. Forsyth seemed to think that the round ball needed fairly minimal twist to stay on track when using massive powder charges thus avoiding the ball stripping. I have definitely found my old rifle likes the heavier charge. My rifle is 12 bore.(.72). I see a number of sporting rifles were two grooved, even Jackob rifles were made. Those early English hunters in Africa often took 20 or more shots to bring down heavy game such as elephant, till the later really large bore rifles were made. Those blokes must have been pretty tough to stand the massive recoil, and brave dropping charging elephant at their feet ! Keep your horse well shod and your powder dry ! 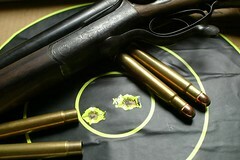 The little Purdey 2 grooves, calibre .45 to .54 or so, were meant for patched ball. One of our locals (Vancouver Island) as a couple of those and they do shoot passably for hunting guns on small game, like deer. So it took me some time but things came together beautifully yesterday morning. 90 grains of 2F Swiss sent a hardened belted ball through him length wise. The ball entering the right shoulder/neck and exited the left rear leg, massive damage. He who lives in the past is doomed to enjoy it. Now that is awesome. Great job! 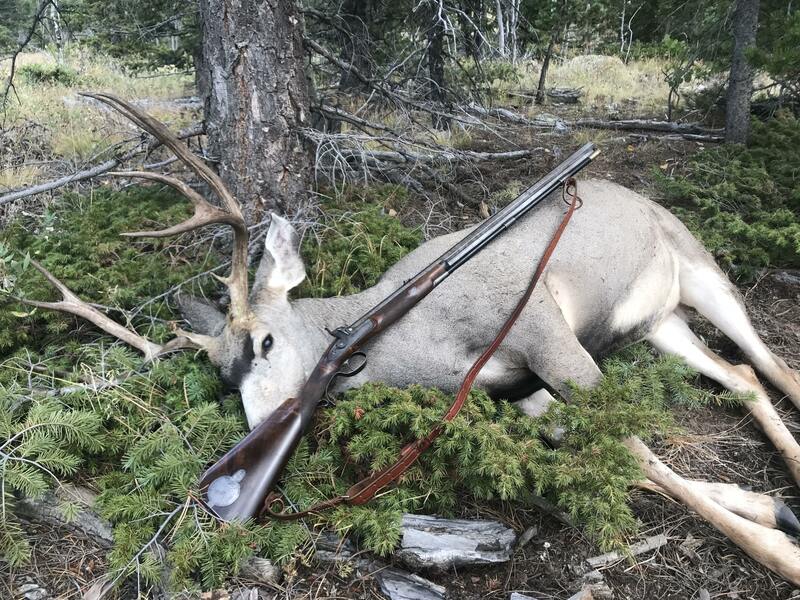 Actually hunting and harvesting an animal with a vintage rifle. Plenty for the freezer by the look of those. 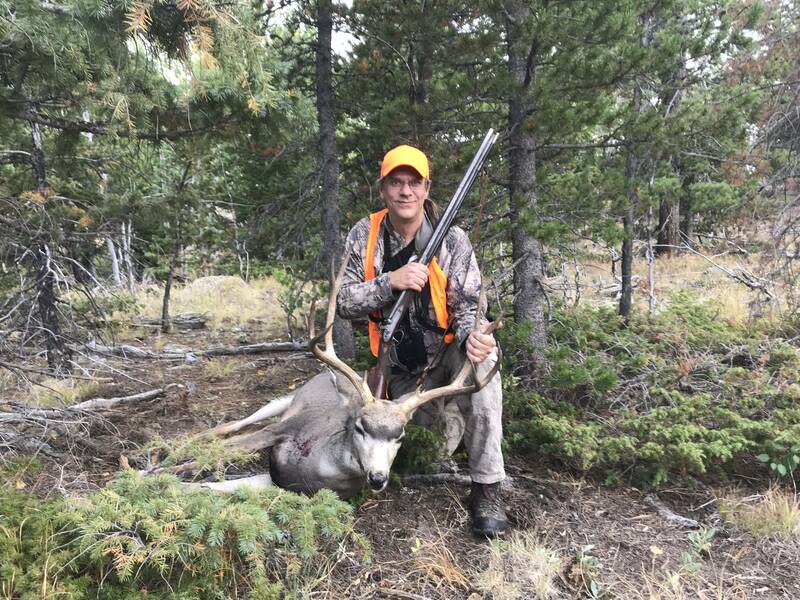 Ver satisfying to hunt successfully with such a lovely rifle. I have 12 bore Isaac Hollis, but no deer handy!! That rifle is SUPER. It looks very much like my Brothers Joseph Lang 16Bore.